Flat Creek Restaurant at the marina is closed for the winter! We’ll re-open Memorial Weekend 2019. 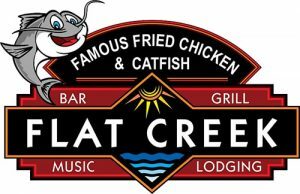 Flat Creek Restaurant is known throughout the Branson area for their famous fried catfish, bbq ribs, signature baskets, sandwiches, and dessert options. Feed the local ducks, fish, and turtles while eating on the dock – kids love it here! So what are you waiting for? Come see us at the marina. You won’t leave disappointed!